I’m hopping by to say Hi to all my crafty friends! I hope everyone had a great weekend and a Happy Halloween. Today a have a sweet shaker bunny card to share with you. I love how this card came out, It’s simple but just so darn cute. To start with I used my Cricut Explore to cut the base of the card. For the circle cutout I just used a circle from the basic shape menu and attached it to the card. I then added a strip of cork which actually is Duck Tape. How awesome is that, Duck Tape makes a cork tape. I really like this tape because the size of it is perfect to add a border to a card, no worrying about cutting straight lines and it’s super sticky on the back. For the yellow polka-dot strip and mat inside the card I used DCWV patterend paper from the Timeless Textured Stack and cut it with my paper trimmer (attached using an Elmer’s Tap Runner). To get the tattered look on the edges I used my Making Memories Edge Scraper. I do love my edge scraper but the blade seems to dull quickly and you can’t change the blade out. *Note to self, need to find an Edge Scraper that you can change out the blade. Now on to this super sweet bunny. I used the bunny from the Craftin Desert Divas Dear Friends stamp set. I stamped it on white Recollections cardstock using Tuxedo Black Memento Ink. I then colored it with Crayola Colored Pencils. Right now I’m just experimenting with different mediums to color stamps. Colored pencils are nice but not my favorite, I’m not too fond of the streaks the pencils leave behind. I hand cut out the sweet bunny then used a black brush tip Zig marker to line all the edges. I also used some black thread to give the whiskers a more realistic look, gluing them down using a very small amount of glue (Scotch Quick Dry Adhesive). 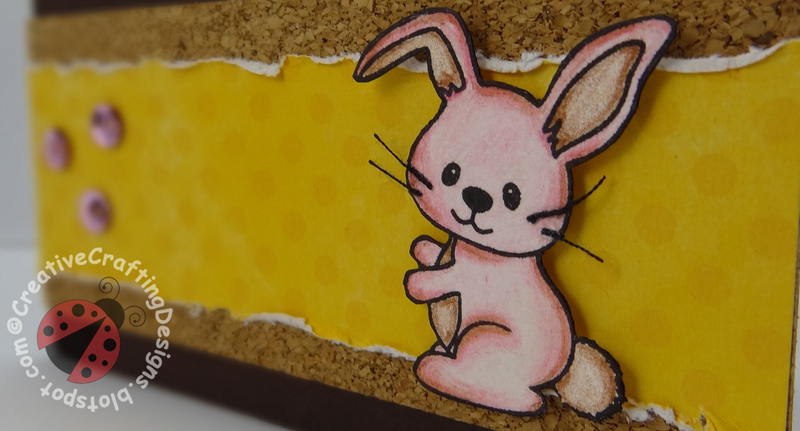 I attached my sweet bunny to the card using Elmer’s CraftBond Foam Mounting Tape. Don’t you just love how sweet this bunny is? Check out this awesome shaker, you can see straight through it to the mat inside the card. I used my Making Memories Fuse Tool (A must have tool for any crafter who enjoys making shaker cards). I cut a circle, with my Cricut Explore, just slightly bigger then the circle in the card. I used the cut circle as a guide, placing it under a Making Memories Page Protector, sealing it with my fuse tool, leaving a small opening just big enough to put sequence in. I then put pink and yellow sequins inside. I got the sequins from Walmart, it’s an assorted rainbow color sequins pack by Horizon Group USA. I also added pink and yellow seed beads that came out of a multi-pack I bought from Michaels. After I put in my sequins and seed beads, I sealed the opening with my fuse tool and attacked it to the back of the circle opening. The clever sentiment “Hopping by to say Hi” stamped on the inside of the card also came from the Craftin Desert Divas Dear Friends stamp set. **If your new to using the MM Fuse Tool, I have some tips for you. If you run your Fuse Tool along the page protector too slow it will melt it too much, if you do it too quickly you will not get a good seal. I recommend to take one page protector and practice with the different attachments, running each alone at different speeds to figure out what speed works just right. Also, do not over-fill it with shaker material, if you do it will not move. The last tip for these shakers, adding seed beads helps to move the sequins around (I did read somewhere that microbeads do the same thing but have not tried it. I finished up my card by carefully gluing on a few pink sequins. I felt it created just the right balance of sparkle. Next PostGobble Gobble Gobble.. Pilgrim Turkey Card.. Plus Freebie SVG File and Digi Stamp!